So we wanted Mexian food tonight and I had figured out how to make healthy tacos sans tortillas but I just wanted Mexican rice too. So I got this nifty thought to go out and look up a recipe for fake - faux call it what you want Mexican Rice but without the rice - Mexican Rice. I found it! I found this wonderful site to make fake starchy foods with vegetables. Check out this link: Linda's Low Carb Menus & Recipes. It was awesome to find a selection that included my rice. 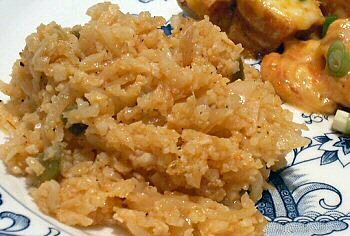 So I tried her rice and I want to share the recipe with you too. I used some specific ingredients so I'll share those below because they will determine the food counts below. Serves 6-1/2 cup servings. Linda's Low Carb Mexican "Rice"
In a large skillet saute white onion until tender/browned. Stir in the grated cauliflower and then the remaining ingredients. Mix Well. Cover skillet with lid and simmer 10 - 12 minutes until the cauliflower is tender but not mushy. Stir occasionally.